This is the story of a perfect vegetable dish on an imperfect day. I don't actually remember why the day was imperfect. It was this week sometime, and I was hot. I'd just come home from work, what felt like a long day. My shoulders were tight and my hands were sore and my eyes burned from too many hours at a desk, staring at a computer. My kids, clean and tired after their day at camp on the beach, were watching TV like zombies. My wonderful husband was home, but maybe at his desk. I was in the kitchen. I was sweaty. I was feeling a little lonely. And I was starving. I remember getting dinner started, and then, while it was cooking, going out to check the garden. I remember finding one lone zucchini that needed to be picked, twisting it off, trying to figure out if one zucchini would make enough for a batch of muffins, deciding it wouldn't. Snapping a stem of basil. Walking inside and thinking, zucchini and basil - that's enough. I shaved the zucchini into ribbons, leaving the seeds and mushy center for the compost pile. I rolled the leaves of basil into cigarettes and sliced them into thin shreds - chiffonade, a word I love, a technique I've mastered. I sauteed the zucchini for exactly two minutes in a dab of olive oil, with a clove of crushed garlic thrown in as an afterthought. 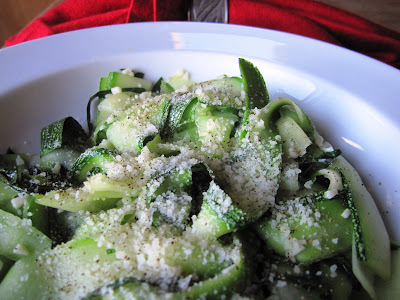 I turned the zucchini into a bowl, added the basil, ground on some salt and pepper, and showered the dish with some grated Grana Padano. So beautiful. So summer. So perfect. And then, before dinner was even ready, I ate it. All of it. Turns out that one zucchini may not be enough for muffins, but it's enough for one very hungry person's first course. Perfect. Thank you so much for linking to my blog and this recipe. I'm glad to have "met" you and look forward to being able to return the favor!